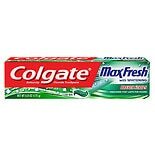 Shop Colgate MaxFresh Anticavity Fluoride Toothpaste with Whitening Breath Strips Cool Mint (6 oz. )6 oz. $329$3 and 29 cents$0.55 / oz. 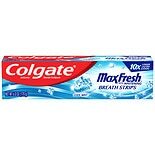 Shop Colgate MaxFresh Anticavity FluorideToothpaste with Whitening Breath Strips Cool Mint (4.6 oz. )4.6 oz. $329$3 and 29 cents$0.72 / oz. 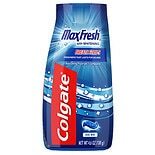 Shop Colgate MaxFresh Anticavity Fluoride Toothpaste with Whitening Breath Strips Clean Mint (6 oz. )6 oz.